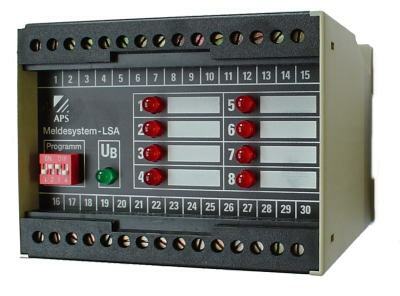 The LSA08 annunciator system is integrated in an isolated housing with upper terminals. The device is snapped onto a 35mm standard DIN 64277 rail, or is fastened onto an assembly plate using two screws. The alarm system has been configured as a relay system, and is thus for the most part not affected by external disturbances. Incoming alerts are indicated using the LEDs mounted on the front side. 8 relay outputs have been integrated to allow the use of additional external visual indicators. Horn- and lamp acknowledgements and lamp testing are made using external buttons. The button for the lamp test is relieved via a relay which has been integrated into the alarm system. Only the control current (approx. 7.5mA) for this relay flows through this button. The relay takes up the actual current for the lamp test (up to 4A/device). 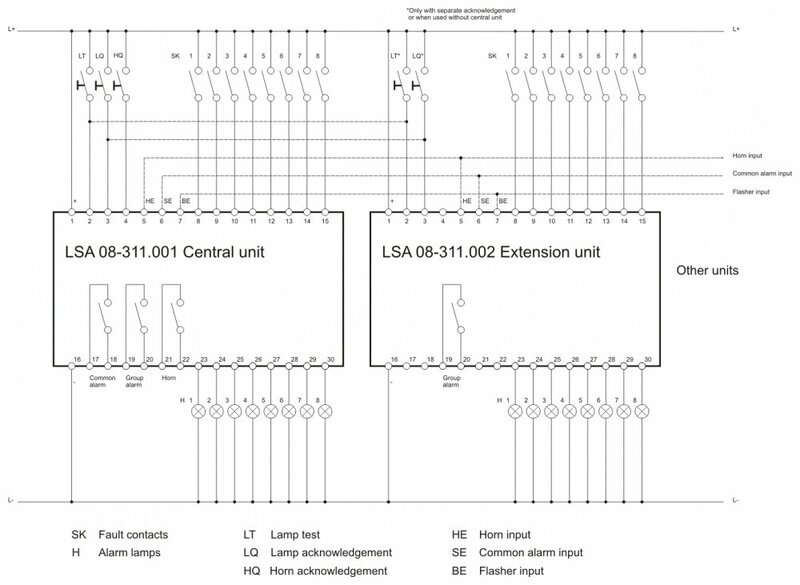 With the system is working with more than 8 alerts, either additional systems of the type LSA 08-311001 or special slave units of the type LSA 08-311002 can be integrated via bus connections. The slave units come with 8 signal inputs and 8 signal outputs as well as a relay output for a group alarm, but do not come with any central functions such as flashers, horn output or group message output. 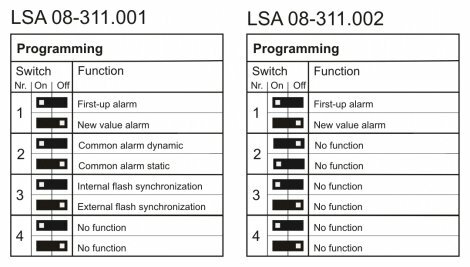 Devices in the LSA 08 family can be combined together to create systems which can handle any number of alerts. 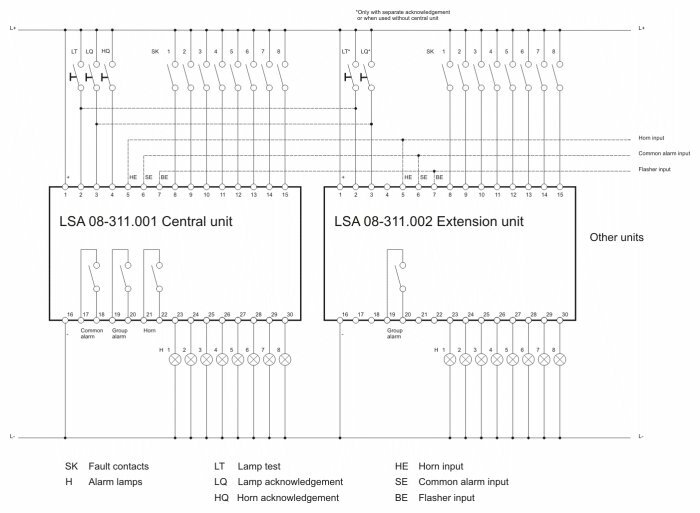 In such a system, at least one LSA 08-311001 unit must be used as the master. Each incoming fault is indicated through the flashing of its associated visual indicator. At the same time, the relay output is energized for an acoustic alert (terminals 21 and 22). When lamp acknowledgement is activated, the visual indicator goes from a flashing- to a continuous light as long as that the fault is still present. The visual indicator will extinguish if the fault was removed in the meantime. The acoustic signal transmitter is acknowledged separately. If an another alert arrives after horn acknowledgement and before lamp acknowledgement, the horn will remain inactive. If several alerts arise one after the other, or almost simultaneously, the indicator will only flash for the alert which was the first to arrive. If an alert becomes inactive before lamp acknowledgement, the visual indicator will continue to flash until lamp acknowledgement takes place. Once this occurs, the visual indicator will extinguish. If another alert arises before lamp acknowledgement for the first-up value indication, the horn will not re-activate. All other alerts will be indicated with a steady light as long as they remain present. 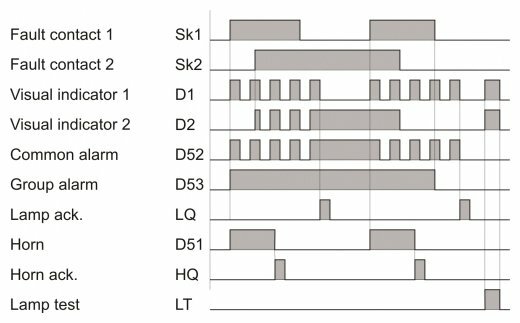 At the same time, the relay output is energized for an acoustic alert (terminals 21 and 22). When lamp acknowledgement is activated, the visual indicator for the first alert that was saved becomes a permanent light, as long as the fault is still present. The visual indicator will extinguish if the fault was removed in the meantime. The acoustic signal transmitter is acknowledged separately.